The use of e-voting has created great interest in learning what it is about, how it works and how it differs from manual voting. Currently a third of the world’s population votes using electronic means. What follows is an ABC of basic concepts related to e-voting. 1.- Electronic voting: A voting system where the voters cast their choices interacting with electronic tools, be it machines that capture the vote directly or through a connected electronic ballot, which is a touch-sensitive input device. It must not be confused with elections where the selection is made on traditional paper ballots but where the count is automated, since only a phase of the electoral process is automated in this case. 2.- Presential electronic voting: Voting that takes place with a voting machine set up at a polling centre that is manned by electoral staff (polling centre workers). The venue changes with the country, but customarily they are schools. Currently, this is the most applied model worldwide. Countries such as Venezuela, Brazil and the USA use this voting model, which allows for a 100% automated election (everything from voter identification to vote capture, count, tally and transmission of results). 3.- Remote electronic voting: Also known as Internet voting, it takes place from any device with online access, such as computers or cellphones, which can be in homes or in public spaces set for this purpose. Estonia and Switzerland are the most advanced countries when it comes to this mode, allowing their voters both inside and outside their national territories to vote online. For the latter case, voters are assigned an unique digital ID number, protected by advanced encryption, which grants them access to a website where choices are made. The votes then travel to a tallying centre through a network. 4.- Voting machines: for votes to be regarded as electronic, they must be cast using a device, whether it is a voting machine or an electronic ballot. There are several types of voting machines, such as those having touch screens (Belgium and some places in the United States), where all it takes to vote is to press the desired option. There are also machines with numerical keypads (Brazil), in which the voter needs to type the number assigned to a given candidate or option. Besides being able to capture, register and count the votes, some voting machines can print a voting voucher that allows for ongoing audits, since each voter can see immediately the electronic choices made match the ones printed on the voucher. This option can be used to settle future controversies or claims, since the paper slips can be counted one by one. 5.- Electronic ballot: Although for many elections the screen in the voting machine may have enough space to display all available choices to carry out the process, there are elections where the need to choose among many offices makes it necessary to use electronic ballots. These devices, used to hold large lists of options or candidates, have been very popular since they work together with the voting machine and are configured according to the specific requirements of the electoral event, as dictated by the electoral commission. Both the use of machines and electronic ballots represents substantial savings in resources, both in the mid- and long term, as well as a simplification of the election, since manual voting requires the mass production of electoral materials and more complex logistics than automated voting. Africa has had to overcome enormous social, economic, and political difficulties to be able to stand before the world as a region where citizens’ rights are respected. Although this is an ongoing task—Africa comprises 54 countries— there are nations such as Nigeria, which are working to strengthen democracy by trying to improve the quality of their elections. One of the resources employed by Nigerians in order to make electoral processes transparent is the shielding of an element that is key to every election: the electoral register. The formula employed is based on biometric technology, which makes it possible to automatically verify the identity of a voter by capturing a physical feature, such as the face or a fingerprint. In order to implement this, the National Independent Electoral Commission (NIEC) has created what is known as the Permanent Voter Card, so that the 68,833,476 citizens called to vote on March 28 for president, 360 deputies and 109 senators, as well as for governors and state legislators, can be sure that their identities will not be stolen, and that there won’t be double votes. 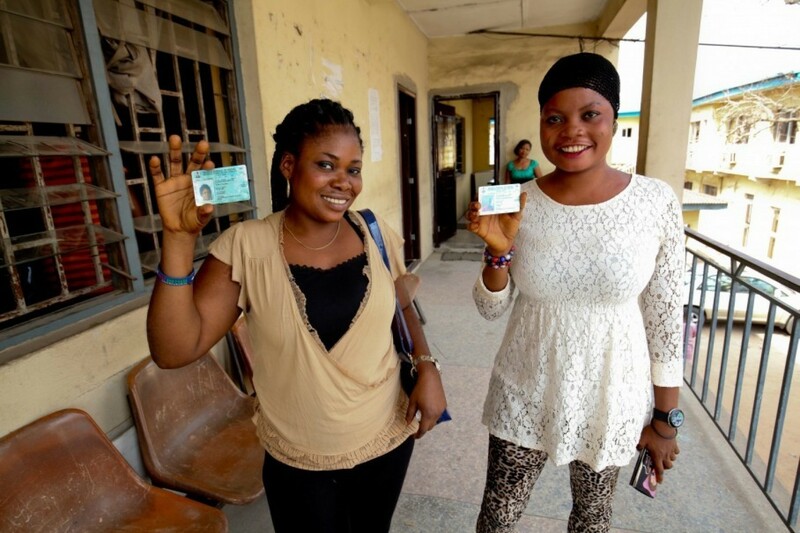 According to the NIEC, each Nigerian voter carrying the card that stores biometric information from fingerprints and face imagery will be able to exert their right to vote once this document is scanned by a reader and their fingerprint is captured to verify their identity, comparing the data saved in the card with those collected at the moment of voting. Following the example from other nations that use biometric identification (like Colombia, Venezuela, and Brazil), the use of this technology in Africa has been on the rise, and Nigeria will join the twenty countries in the continent that have carried out elections using a biometric electoral register. The expansion of this tool is due to the fact that identity theft has altered electoral results in several nations, eroding the citizens’ trust in the system, and forcing authorities to seek the best practices to safeguard suffrage. Nigeria has been facing threats from political violence during the last few weeks. However, electoral technology—biometrics, in this case—can help the country to fulfill its fourth general elections since gaining its independence in 1999, with no setbacks. With the use of biometrics, the country has made a winning bet.